Is this a new color or did it come out last year(or another time)? I love it! love the bit about the pumpkin :) it's the little pumpkin that could!! I need to get this! I love it!! Reminds me a lot of Fortune Teller. Love! I like that over Finger Paints. Nice fall shade. I'd heard it was close to Ick-A-Body but I don't care, I NEED it. And wow, I didn't know pumpkins could last that long! Wow, that looks so GOOD layered. I'll have to see if I can find it! I need this! And I love that you still have that pumpkin! We keep ours for ages too, and people think we're weird. I just took pics of this on my nails, Im using it today over Sinfulcolors Black on Black. wahhh every time I read your blog, my nail polish wish list gets longer and longer! Really need to go track this down, the color is so beautiful. LOLL that's one hardy pumpkin. I MUST HAVE!!! I love orange and black together, reppin my team!!! I'm LOVING this polish, and Hallowe'en is one of my favourite holidays of the year! 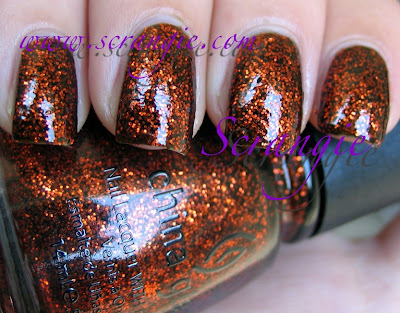 And "Pumpkin Spice" is the perfect name for this polish. OMG - how the heck did you get your pumpkin to last that long? I got one last year and it only lasted a couple of weeks before it got soft! I love the Xtreme Wear polishes, and this one is so pretty! I can't believe that pumpkin lasted that long! I love Halloween. I was born that day and ever since its been my favorite holiday. Its the only one I dont mind if it comes early and lasts all month long. Also that is an amazing pumpkin. Your house must be the perfect temperature and humidity. I love this! I'd only tried two coats on one nail - it's not bad after 4 coats - I think I'll break it out over the weekend :) Great pictures. Fun shade...I will have to look for it - though rare I ever see any of the SH that show up on blogs...they are so picked over living in a rural area - the kids get to them first it seems. I think they walk over to the drug store ever day from school just to see what's new and hang out. Gorgeous! The first thing to get me excited about the end of summer. Hard to believe that there's already Halloween polishes coming out. I think this would make a great Thanksgiving look too,especially over Fingerpaints Cordur-orange! OK, the pumpkin that won't die is just insane. It's like some kind of vampire pumpkin. Are you sure it isn't sucking the life force out of your other produce? look awesome and i want this! i feel like i need to go out and trying to find that polish! LOVE IT! wow! that's a long time!! This is so gorgeous! Eee I am so excited that the Halloween polishes are coming! We have a poinsettia plant that we've kept since December and it's still alive! No flowers, just leaves, we're hoping it will bloom again in the winter. I love Halloween and thinking about October polishes gets me all excited too. Great post. Just grabbed the last one from my Walgreens! While I was there I also picked up Essie Little Brown Dress while I was there so I can layer it. Love it! Hmmm... I may have to rethink this one. I saw it at Walgreen's but I have 2 of CG's Fortune Teller from a couple of Halloweens ago, so I passed. Looks amazing layered! I love it best over medusa - looks so warm and autumny! I wanted to get this but I've got Ick-a-body and ChG Spellbound and ChG Fortune Teller. I had to draw the line. Sigh. Now, of course, I want it! You are the best and the worst! Best lemming inducer and worst for my wallet! I looked everywhere for this nail polish today. I'm so sad I couldn't find it :( I love Halloween and I'm so ready for it to be October! I need this polish!! And AWESOME pumpkin! It's amazing it lasted this long! LOVE it over Black Tie Optional! I'm so happy I've got this one! Love all the different layering options. I can't believe that your pumpkin is still here! lol, how in the world did that pumpkin survive! freaking post apocalypse pumpkin! I NEED this polish! I met my husband on Halloween, and my daughters school colors are Orange and black. Perfect color for our house! I am so excited about the Halloween polishes. I did not get a single one last year, and Halloween is my favorite! I would LOVE to see this layered over RBL Piu Mosso. I think they'd be an interesting layer combo! You've got me planning my october mani's already!